We are commited to meeting the needs of our community caregivers as well as the needs of our clients. Consultation with caregivers and families on making future plans for caring for their loved one. We provide a tremendous amount of activities that help our members maintain their mobility and physical independence. We focus on the client’s strengths, as well as weaknesses, and use every interaction as an opportunity to help them feel good about themselves and their time spent with us. We have several special interest clubs where our participants can meet and share their life experiences. 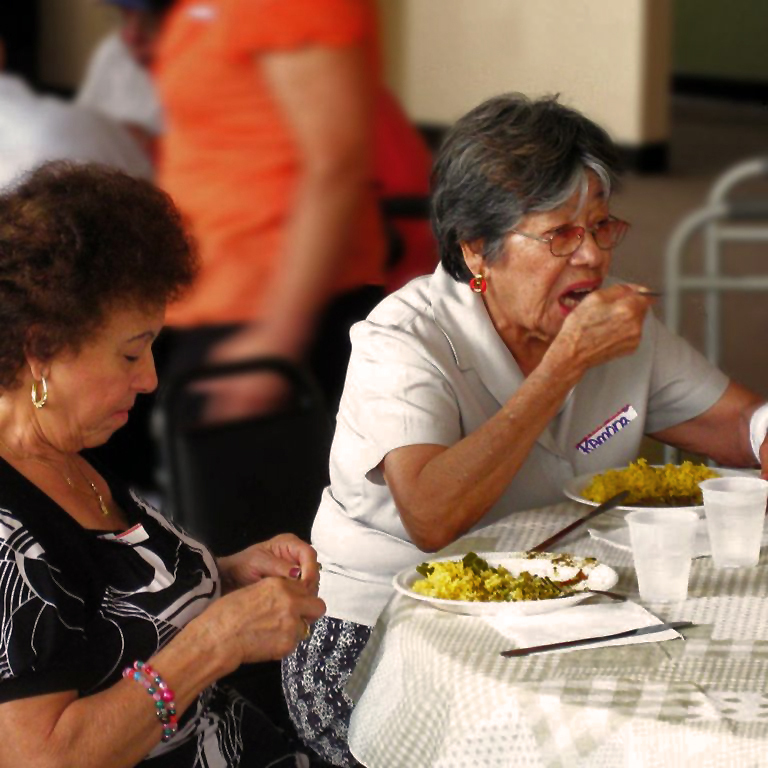 Special activities such as exercises, yoga, Tai-Chi, computer and English classes, weekly field trips to museums, parks and other cultural centers also enhance the Fuente De Vida experience. We provide nutritious breakfasts, lunches and an afternoon snack as part of the Fuente De Vida program. Our experienced chef creates a daily menu that provides our participants with balanced nutrition, and tasty, well presented meals that assure a daily intake of needed nutrients. *Special diets are easily accommodated and assistance at meal time is always available. Our center has a unisex beauty salon staffed by outside beauticians familiar with handling the special needs of seniors. Your loved one can enjoy having their hair cut and styled, as well as receive a relaxing manicure. We also offer pedicures and chair massages done by these professional beauticians. For participants regular beauty appointments can be scheduled with the beauty salon through the center. It gives your loved ones just one more special reason to attend. Fuente De Vida provides door to door transportation from your home to our center in the morning and evening. In addition, we are happy to arrange senior transportation to and from all medical appointments outside of our center and if necessary, help you with the required paperwork. At Fuente De Vida Center, not only the staff welcomes and appreciates volunteers, but our clients are glad to see new faces and make new friends, too. In fact, volunteering is a win-win situation. Helping victims of devastating diseases and their caregivers will invigorate you personally and prove to be very rewarding and satisfying. Being a blessing to someone else will bring you many blessings in return.